March 30, 1994, will go down as one of those great and memorable days in West Indies cricket history. 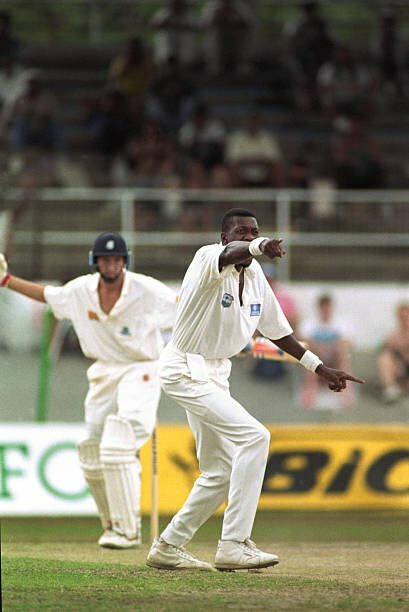 Queen’s Park Oval swelled with West Indian pride and joy, as fast bowling heroes, Curtly Ambrose and Courtney Walsh, bowled the Caribbean side to one the most amazing wins! England were shot out for 46 – yes 46 all out – as the Windies won the Test by 147 runs. Ambrose took 6-24 and Walsh had 3-19, as well as a run out, to spark celebrations and the series win, which kept the prestigious Wisden Trophy in the Caribbean. Richie Richardson, captain of the side, remembered the historic match. He said it was one of his best days wearing maroon cap. “It was a miracle! It was 25 years ago, and I can still clearly remember the fourth afternoon when the miracle started,” he said. Ambrose had earlier grabbed 5-60 off 29 overs in the first innings and was virtually unplayable in the second innings and ended the match with 11 wickets for 84 runs. He was the obvious choice for Player-of-the-Match.